If you've been to this blog before then you know a few things about me. One is that I like one-pot meals such as rice or pasta...especially pasta. And this is a good example. I've been ill for the past few days (a cold) and actually took the day off work yesterday, which is unlike me. But while being self-sequestered at home had difficulty doing absolutely nothing, so I did something that nourishes both body and soul...I cooked, and also baked bread. Checking my fridge I came up with the ingredients for this dish and it turned out to be just what I needed...perfect comfort food for a winter's evening. 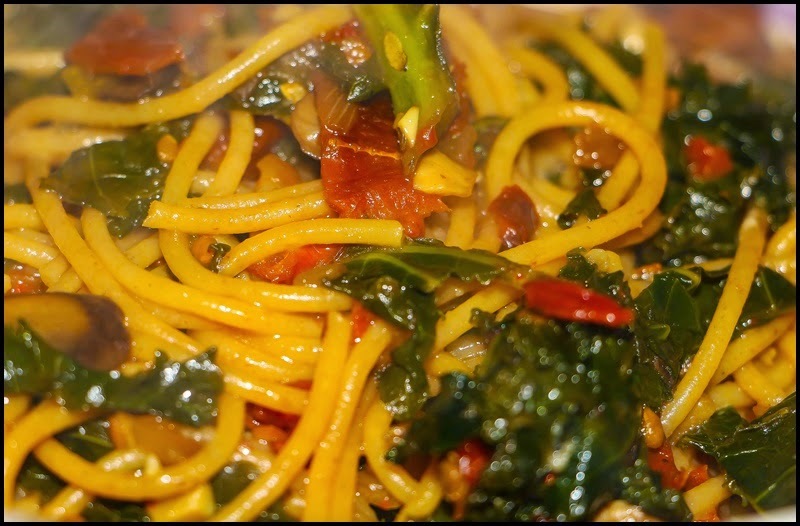 And as usual, this recipe is simply a guide and not a blueprint...it is really just a sort of elaborate variation of the many aglio e olio recipes posted on this blog. Add or remove whichever ingredients you have at hand or suit your taste. Boil the spaghetti al dente, drain, and set aside. Heat the olive oil in a large skillet or shallow sauce pot over medium-high heat. Add the onion and mushrooms and sautes them until they begin to brown, then add the garlic and hot pepper and saute another minute or two. 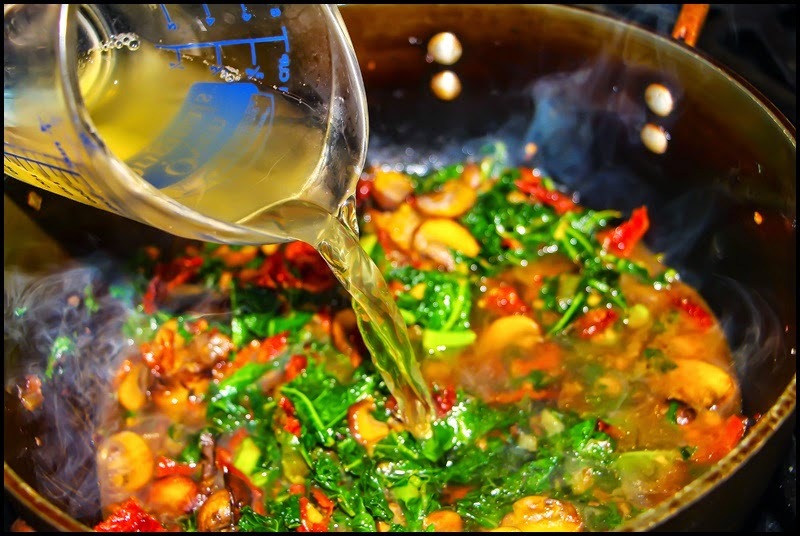 Stir in the kale and sun-dried tomatoes, coating it with the oil and seasonings, then add the broth and salt. Bring the broth to a boil then lower it to a simmer. Simmer the broth for 5-10 minutes, or until it reduces by two-thirds and is concentrated in both flavor and viscosity. 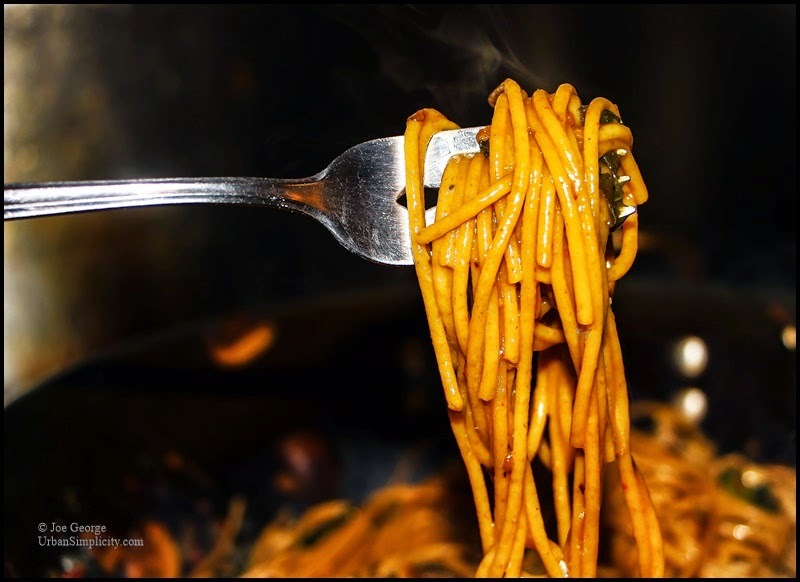 Add the cooked spaghetti and simmer it while stirring gently for a minute or two, allowing flavors to permeate the pasta. Remove the pan from the heat and stir in the cheese.